"Powerful, at times shocking, but also intensely human." 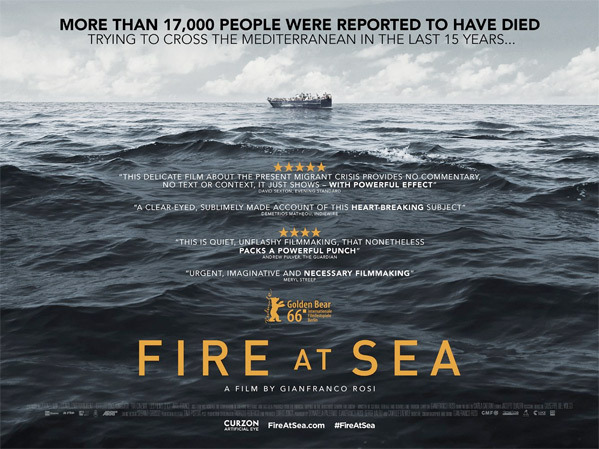 Kino Lorber has debuted the official US trailer for an award-winning documentary called Fire at Sea, or Fuocoammare, from Italy about the migrant crisis affecting Europe, the Middle East and Africa. The doc won the Golden Bear at the Berlin Film Festival and has played at numerous other film festivals including Telluride, Toronto and New York (coming up). The film is set on an island off the coast of Italy called Lampedusa, one of the places many migrants and refugees crossing the Mediterranean by boat end up. Fire at Sea was also just selected by Italy as their official entry to the Academy Awards this year, a strong push for this doc to get even more attention. I recently had the chance to see it and wrote that it's a "slow burn, but builds to a bonfire." Highly recommended for doc fans. Samuele goes to school, loves shooting his slingshot and going hunting. He likes land games, even though everything around him speaks of the sea and the men, women and children who try to cross it to get to his island. But his is not an island like the others, its name is Lampedusa and it is the most symbolic border of Europe, crossed by thousands of migrants in the last 20 years in search of freedom… Situated some 200km off Italy's southern coast, Lampedusa has hit world headlines in recent years as the first port of call for hundreds of thousands of African and Middle Eastern migrants hoping to make a new life in Europe. Rosi spent months living on the Mediterranean island, capturing its history, culture and the current everyday reality of its 6,000-strong local population as hundreds of migrants land on its shores on a weekly basis. Fire at Sea is directed by Italian filmmaker Gianfranco Rosi, of Sacro GRA, Below Sea Level, El Sicario previously. The doc first premiered at the Berlin Film Festival, where it won the Golden Bear. Kino Lorber will release Fire at Sea in select US theaters starting October 21st this fall - find the theater listings here. "Powerful, at times shocking, but also intensely human." Reminds me of the movie Gomorrah that I highly recommend. Powerful. Another reason to be happy to live in America. No, I do not. Maybe if you understood context clues you would get it. Fair enough. Didn't mean to be offensive. People can have different opinions. I just happen to believe in my country quite strongly. Europe's decision to handle the Syrian refugee crisis the way they did will come with serious ramifications. I guess we will just have to agree to disagree. I like your positiveness shiboleth. You're like a bright sunshine in this murky darkness.